Aimed to provide an afternoons interesting listening - to entertain, inform and educate. 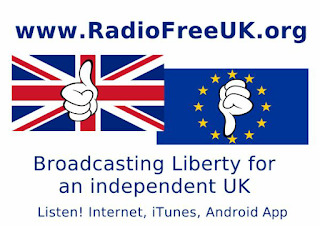 A bit like BBC Radio 4 but without the relentless left wing spin on everything! As a segmented podcast you don't have to listen to our whole show in one go or at any particular time - you could spend an afternoon with it - or spread it out over the week - if any bits don't appeal to you simply skip them! and for the bits that particularly appeal you can click trough to the original articles and find out more. We host a number of podcasts that we use in the main programme - so you can even subscribe directly to them if you want more of an intense hit rather than our magazine format. Better Off Out, Alans Antics, Jake the Writer and Batsby. But what we need most is more listeners - the more listeners we have the more contributors we can attract, the more contributor we can attract the more listeners etc... So by sharing and recommending RadioFreeUK.org everyone wins - its a virtuous circle. This week programme: We kick off with updates on the EU Referendum Campaigns - three of them now - Leave.EU, Vote Leave and Grass Roots Out. We have a small collection of some particularly relevant speeches made in the EU parliament. We have items from our regular contributers - the second edition of the new Better Off Out podcast, Godfrey Bloom on a subject that matters to us all - money!, the weeks headlines from Scottie K and a tale from the youth of Jake the writer. We continue with the next part of our audiobook, and have a wild card an iterm from Tom Woods' very popular US podcast - a very interesting discussion of The Over Population myth, I love the way this is presented with out reams of statistics, but with clear short examples that can be easily understood and can't be contradicted. In the mix we have other interesting items - often read by Alan Taylor Shearer - thanks Alan! Great work. And as we always try to do - we finish with a funny from Batsby. Listen on - and enjoy the show(s).